To see DioMet's range of standard stainless steel handrail designs and prices please click the image below. For any bespoke requirements please email us your handrail enquiry or call 0114 243 9009. What different types of stair handrail are available? 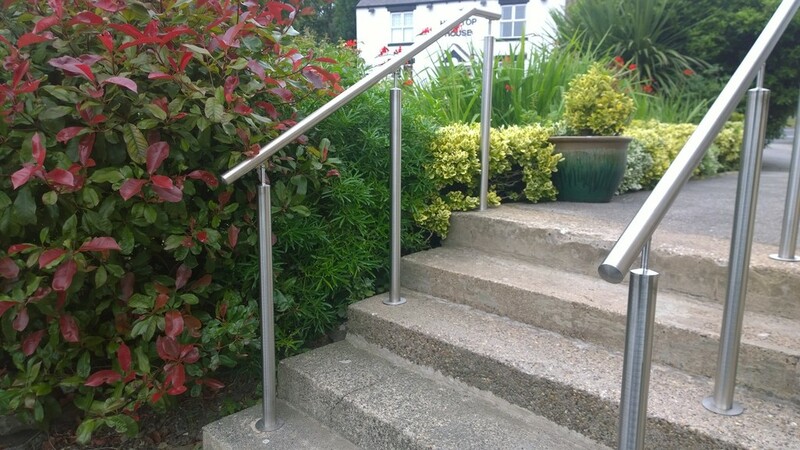 Stainless steel handrails or powder-coated handrails? More information on our handrail styles can be found here : Types of steel handrail. Ordering and installing a handrail can be a rewarding DIY project and save on the costs of tradesmen. DioMet's DIY handrails are mostly suitable for installation by anybody with reasonable DIY skills - we dispatch our handrail systems to the whole of the UK in kit form on a daily basis. What is the purpose of the handrail? How is the handrail to be mounted or fixed? What tools are required for assembly? What handrail fixings are required when buying a DIY kit? Handrail and balustrade installation basics? Building control - Do they know their onions? For more information see the full article here : Do glass balustrades need a handrail? What are modular stainless steel handrail fittings? What grades of stainless steel are available? How can you differentiate the quality of handrail fittings between suppliers? Buying components vs pre-assembled systems? Q. Do your handrails come in 1 piece? A. Most of our stainless steel handrails come in 1 solid length up until sizes past 3500mm, they are then jointed in the middle for longer lengths. The reason for this is we are unable to send anything through our courier system over 3600mm so if you wanted a larger size, we can make it and you are welcome to collect. Q. Does the handrail come with everything to fit it? A. Yes. The brackets come separately to the rail but the appropriate screws to attach it to the rail are already in the pre-drilled tube. Along with the brackets you will also receive the correct amount screws and plugs to attach to timber or masonry walls. Q. What diameter are the handrails? A. As per stock they are 42.4mm in diameter as standard. We can offer a 48.3mm diameter, ask us for a price. Q. Can these be used anywhere? A. As per standard they are made from internal 304 grade stainless steel and should be used for internal projects, however, we can manufacture them in 316 external grade stainless steel – ask for a quote. Q. Can you provide the handrails with a bend in them? A. We can, please forward any details you have to our email and we will quote accordingly. Q. Do you provide a fitting service? A. We do, however all of our products can be fitted with minimal DIY skills along with help from the provided fitting instructions. Q. What grade of stainless steel do you use? A. We offer 304 grade stainless steel which is used for internal use only and we also do a marine grade 316 grade which can be used for external applications and to protect against the elements. Q. Do your products meet building regulations? A. All our items can be made to suit relevant building regulations. The structural products we provide such as Balustrades, Balconies and Staircases are already designed to suit building regulations but always check with your local building control office if unsure. Q. What is your lead time? A. On bespoke stainless steel handrail items it is usually only 4-5 days and stock items are no longer than 2-3 days. Please ask us if you are unsure about specific item lead times.